This past winter while walking around M St, I noticed a small sign on the door of Dean and Deluca, “Jamon Iberico: $80 per lb.” As much as I love dried and cured meats, I couldn’t imagine paying that much for a slice of ham. But little did I know, Spanish jamon iberico is nowhere near your typical Hormel deli meats but the Rolls-Royce of everything porky. Jamon iberico entered my life again when I started becoming obsessed with Spanish food after watching Anthony Bourdain gorge himself on No Reservations. My mom bought me a wonderful cookbook called Culinaria Spain that covered all the country’s different regions and cuisines, and there it was: a huge blown-up picture of the black bellotas and what they would soon become. But I never thought I would get to try this ridiculously expensive ham (which is also extremely hard to find in the US since only a couple slaughterhouses in Spain meet the necessary USDA regulations) so imagine my surprise and childish delight when I found it being sold at the C!tysuper (think HK’s version of Whole Foods) for about $12 per package (which is still pricy since each package only had several thin slices) in Hong Kong of all places. I know, I know. If I’m in China, what the hell am I doing lusting over Spanish food? But, everytime my friend Kendall and I would get groceries, we’d find an excuse to wander to the deli section for samples straight from the leg. So my first jamon iberico experience? Absolute loveliness. Kendall and I bought two packages of 20-month-cured jamon, a crusty baguette, one tomato, and a juicy ripe melon. 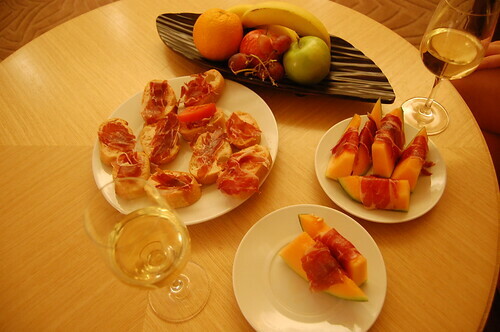 When we got back to the hotel room, we sampled the jamon on its own first, then wrapped some around the melon, and finally, smeared tomato all over the toasted bread and topped it with the meat. Everything was delicious, and though you may think that was an awfully light dinner, we were both feeling incredibly satisfied once we finished it off with a good bottle of white wine. While I would never buy this regularly, jamon iberico certainly has a reason to be that expensive. It was complex, smooth, and truly special, and I’ll always remember its distinct and delicious taste. Even now I’m drooling just thinking about it. One day I’m gonna have to go to Spain just to have it again. You are currently reading Not your average ham at Notes on Food.